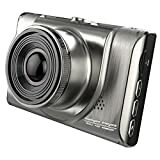 If you are looking for a higher end dash cam that is going to suit your needs, the Blueskysea Mini Discrete Dash Cam may be the car camera you are looking for. 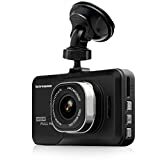 There are plenty of reviews online to suggest this is one of the best dash cams available in the current market and even though the price tag is a little more than its competitors, it definitely does what it should and a lot more. G-Sensor file protection – A common feature implemented in dash cams these days is the G-Sensor file protection. If there is a car accident it will automatically detect the impact and it will protect all of the files and recordings. So even if the dash cam breaks, all of the files can still be recovered and viewed normally. Parked car surveillance – This feature is great for those that leave their dash cam in their vehicle all the time. It uses motion detectors for when you’re not around and it will automatically turn on and record the events. This is perfect if your car is parked outside your house overnight because it will record any suspicious activity around your car. Unique up-side-down mounting – This product is based on an up-side-down mount so you can adjust the stick angle as you wish. Different resolutions – This dash cam has many different resolutions for you to choose from. Anything as big as 2560×1080 to as small as 1280×720. The video quality can also be adjusted from normal to super fine, and will take up less/more storage space depending on what settings you choose. The same settings can be adjusted when taking photos as well. 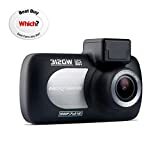 Large storage capacity – This mini dash cam has 2 SD slots which can take 128GB in each, giving users a total of up to 256GB of storage space providing they have purchased the SD cards separately. The 256GB of storage space can provide around 33 hours of recording time depending on video quality and resolution settings used. 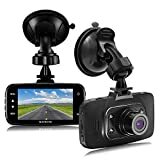 Instant playback – This mini dash cam comes with a small screen that will allow users to playback any recordings whenever they see fit. Mini design – This mini compact design is perfect for not only recording the road when driving but it’s also great for parked surveillance during the night – it’s very small so no one will see it if it’s positioned in the right place. File coding – H.264 coding MOV files means recording takes up a lot less space because the .MOV file format isn’t as big as others. 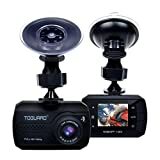 Other dash cams may only provide video playback in files such as .AVI or .MP4 which take up a lot more room. 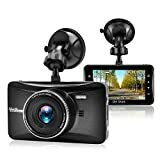 All in all, if you are looking for a simple mini dash cam that is going to protect you on the roads then the Blueskysea Mini Dash Cam may be the one for you. It provides a lot of features and a variety of video settings to make recording less or more detailed depending on your needs for storage. It’s very easy to install, a simple adhesive sticker is all it takes to stick the cam to the windscreen and the motion detection feature means you don’t have to press any buttons for it to start/stop recording. As for its price tag, it’s a little more expensive than its competitors but with all the features you get with it makes this dash cam worth forking out for.